5 Best Dog Doors In 2019 — Regular, Electronic, Sliding, etc. The best dog door allows you, the owner, to offer the best of both worlds: your dog can enjoy the comfort of your home, and go explore outside. The best pet doors for dogs should offer an easy setup, a safe use, and the most expensive dog doors even have a microchip identification before allowing any dog to pass through. Yep, doggy doors are that smart these days! 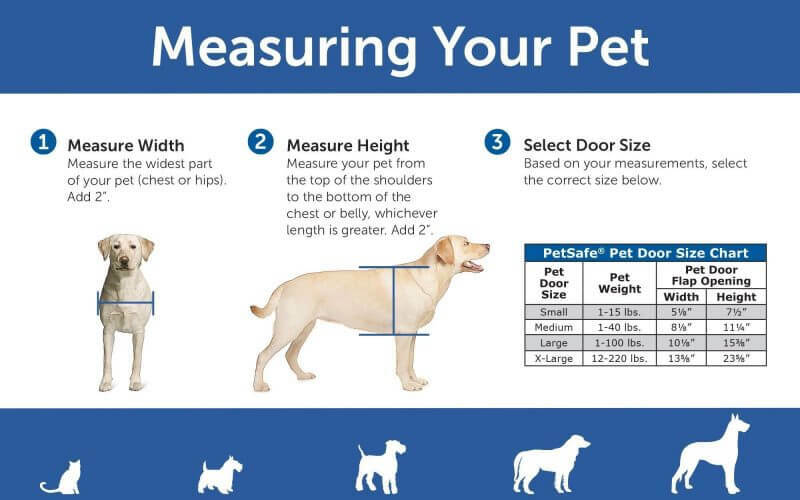 how to measure a dog for a pet door. Let’s start with helping you know what features and specifications to consider the most when buying a doggy door. Let’s face it – all dogs want to go outside, exercise, socialize, sunbathe, or simply get some fresh air. The problem kicks in when your dog unintentionally invites an unwanted guest and makes a mess of your flooring with mud tracks. In the same way, dogs who can’t easily get out through the door may start to have urinary problems for keeping it too long. Anxiety is a big problem for active dogs who are forced to remain indoors; this often translates into destructive behaviors. These scenarios may occur if you don’t have a pet door, or if your current pet flap has poor security features and durability, which is why you may need to replace it. 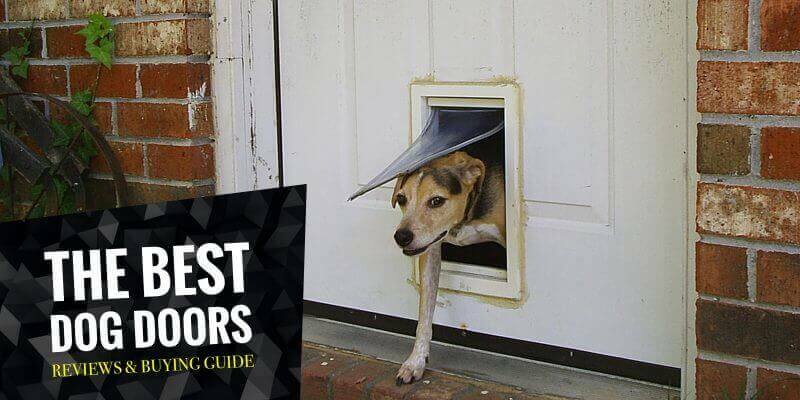 When wondering what is the best dog door, you might find the task pretty daunting, but it’s simple once you know what to look for. Here are some of the key factors when deciding which pet door is made for you and your cats and dogs. Remember that a dog can gain and lose weight, just like you! A dog door should be just the right size for your dog – perhaps even a little bit bigger in case he or she gains more pounds. As a bonus, if you have cats in the house or other pets as well, they may also be allowed to use the door for their own business. 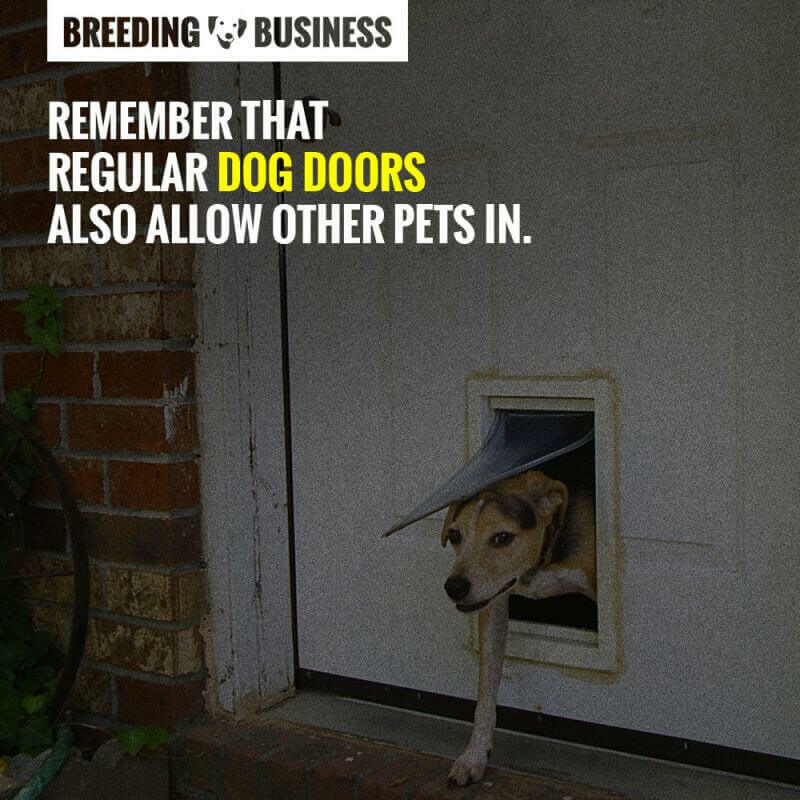 Keeping stray dogs out is one of the challenges that a doggie door can face, especially if you own a female dog in your house. Female dogs can have many boyfriends at the same time when they go outside – and this can be a problem if you don’t want puppies from an unwanted breed of dog! In the same way, stray dogs may also adversely affect males, since they might have fleas or some skin diseases that your pet can catch. Moreover, most of these stray dogs may also make a mess of your home, so you have to find a way to keep them out and keep your own pet in. Other animals like foxes and raccoons can sneak into your home and cause some unfortunate damages, or just a big scare. Regardless, it’s the first choice you have to make when browsing dog doors: electronic pet door with identification, or regular flap allowing everybody inside. Another thing that makes a doggie door effective is that it can block the cold weather so you save more energy in your house in the long run, especially during winter. It can also work the other way around during the summer, when you don’t want the cool air-con wind to leak outside. Most people don’t add a dog door to their house due to this factor, and simply open the main door when taking their dog outside, but this can have bad effects on the dog (as mentioned above with the urinary problems.) What you just need to consider is a dog door that easily closes – and tightly to avoid leaking out cool air during the summer or leaking out warm air during the winter. Magnetic closing systems are great at leaving no room for air to circulate. Consider a pet door that gives you an easy yet secure installation method. In fact, some of the best sliding dog doors are so simple that you don’t need a lot of tech or carpentry skills to install them, much like putting together a doorbell system in your house. Sliding doors are perhaps the easiest, but it depends on the type of installation for it. Regular door installations are the most common out there with a cheap to moderate cost. Wall installations can be a bit harder but have the same cost. Both require cutting through. Sliding dog doors or panels that are inserted into the door are easier to install and require no cutting. However they will only work for sliding panels, usually found in condos or patios. They tend to cost more because they aren’t just a dog door, they are a full glass panel. Do consider a doggie door that has long-lasting durability against the elements and your dog’s come-and-go routine. A waterproof dog door is a great choice if you live in a place where it often rains. Do remember that most higher-priced dog doors do offer more durability because of the materials used to conceive them. The outer part will require a lot more cleaning so be prepared for that, too. If you go with an electronic dog door, make sure you have enough batteries to change them every few weeks or months. I wouldn’t spend less than $30/50 unless you have very low expectations and won’t bother a bad product. For safety concerns, I would personally spend the extra money to get an automatic dog door allowing only my dog inside and out. This PetSafe dog door is battery-powered and embeds radio-frequency technology to only allow authorized pets in. Dogs wearing the SmartKey on their collar are allowed in, otherwise the doors remains solidly shut. It’s amazing to keep stray dogs, cats, foxes, and raccoons outside your home. One SmartKey is included when you purchase the door, you need buy additional keys for each pet you want to allow through this electronic doggie door. If you just want to use the door as a regular flap, it’s possible. There are three modes available with the PetSafe SmartDoor: locked, unlocked and automatic (only allows identified pets.) The documentation delivered with it is great according to most reviewers! If you are a first-timer with electronic dog doors with that type of identification, you may find the transition challenging. There are a few points to address or get used to. Dogs play near the pet door and unlock the door without wanting to, and this can get annoying at first but you can turn the locked mode on. Batteries may run out after few weeks (or months) depending on how often your pets go in and out, again, just leave it unlocked when you know your dogs will keep on passing through. For safety concerns, dog flaps only allowing identified pets should be favored. The additional price is totally worth it! If you want to schedule periods of time during which the door should remain shut even with identified dogs, you can set this up easily using the Curfew Mode. You should be protected against bad weather since this doggie door closes using gravity first, but also boasts a secondary magnetic system for a firmer lock. On the flipside, it is a little pricey for a dog door, especially when compared to very regular dog flaps. However, money shouldn’t matter when you buy a much safer equipment. Not allowing random animals in your home is kind of super important, don’t you think? While it boasts an unbeatable price tag, this cheap dog door doesn’t look bad at all. 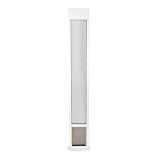 It’s slick, made of plastic and aluminum, and sturdy enough to last you a long time even with daily usage. Don’t worry about small crawling and flying insects, and even less about weather resistance: this dog door comes with a magnetic closing system that will firmly keep the door shut. Such binary mechanism can be worrying in some neighborhoods in which stray or wild animals are common. Trust me, some are smart enough to figure it out, especially if they see your dog doing it once or twice. The Freedom Aluminum Patio is a top choice for those you have sliding doors at home, or in a condo or rental. Simply replace one of the regular panels leading to your patio or conservatory with this one, lock it properly and you’re good to go! 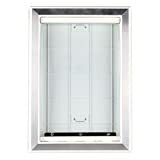 The dog flap is located at the bottom of the sliding panel and requires nearly no cutting or installation itself. Because the size of the Panel matters a lot, it comes in various colors, heights, weight, and even thickness. In the United States, most sliding doors are standardized therefore making the rails and tracks an irrelevant worry (it should work!) Unlike other dog doors requiring a lot of prep time, this sliding dog door requires no cutting whatsoever. 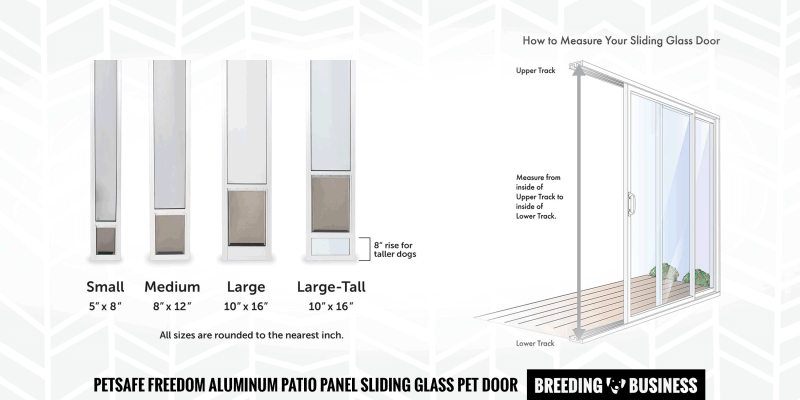 How to measure for a dog sliding door? Some cons have been mentioned by various hands-on reviewers but they are tiny details such as needing two people to set it up properly inside the upper and lower tracks, and things of the sort. Otherwise, it’s pretty straightforward and has a great dog flap that actually melts in your home design perfectly. Overall a wonderful product for those who want a simple-to-use, no-hassle pet door. It is still going to allow foreign animals in, but it is the best dog door under the $100-mark. How to measure a dog for a dog door? As we mentioned above, it pays attention to have the right dimensions for your pet door, so as not to hurt your dog when they are trying to get in or out (especially if they are suffering from arthritis.) To measure your dog, use a tape measure and start from your dog’s belly and work your way to his or her shoulders. Height of the dog – this can be seen as the distance from the ground to your pet’s shoulders. Width of the dog – this is the measurement of your dog’s widest chest part. Leave out the fur in case you have a fluffy dog because it’s not going to hinder the dog’s movement anyway. Rise height – the distance from the ground to your dog’s lower chest is the measurement you are looking for, which is about 1 to 2 inches, depending on the breed size of your dog. To make room for growing dogs or if ever he eats too much over the course of the months, lengthen your measurement to about 2 inches for the height and 1 inch for the width. You can also add more to this number if your current dog is still a puppy and needs more room to grow. The above mentioned measurements will make it easy for your dog to step over on and get through the dog door with great confidence. On another note, if you keep more than one dog in the house, you need to consider both of their measurements and combine them together to go for the best dog door that will fit both of them. For instance, one dog may be pretty tall but the other dog has a wide body but can’t reach the rise height. This can be a bit tricky, but with the right measurement techniques we mentioned above, you’ll be fine. I appreciate what you said about the height of the dog being a key measurement and how it can be seen as the distance from the ground to the pet’s shoulders. I think that installing a dog door is a great way to free up some time by not having to take your pet out. My wife and I have a corgi, so we’ll consider getting a dog door to give him a little more freedom.